It rattles and leaks. It’s too low. It’s broken. These are all signs that it’s time to replace your toilet. Fortunately, the experts at Mansfield Plumbing are available to offer cost-saving advice on how to select a new toilet for your home. Miller recommends starting the search by looking for toilets marked with the WaterSense® label. WaterSense is a partnership program by the U.S. Environmental Protection Agency that seeks to protect the future of our nation’s water supply by offering suggestions for using less water with water-efficient products. Toilets earning the WaterSense label have been certified to be at least 20 percent more efficient without sacrificing performance. Miller suggests visiting the Water Savings Calculator at the Mansfield Plumbing website to determine how much savings a family can gain by investing in different types of toilets. For example, a family of five can potentially save 20,257 gallons of water a year using a 1.28 Gpf toilet … which can equate to an estimated $80 savings in water bills. 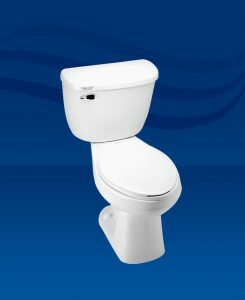 Stay tuned to our next blog to learn about selecting a toilet style for your home.